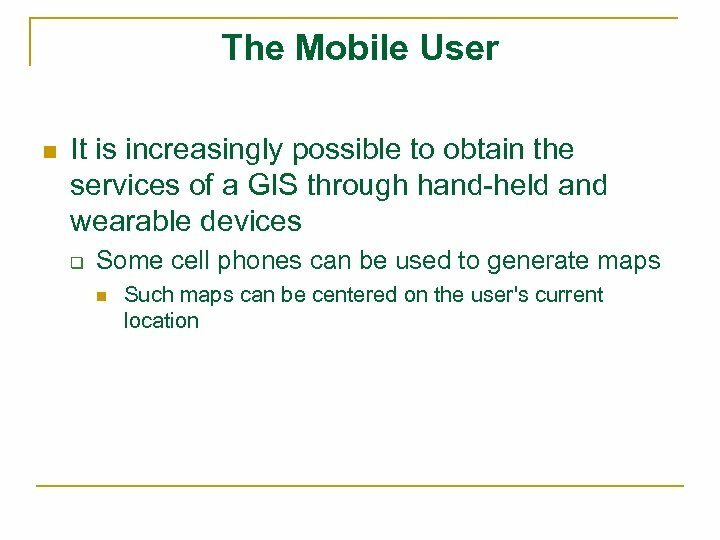 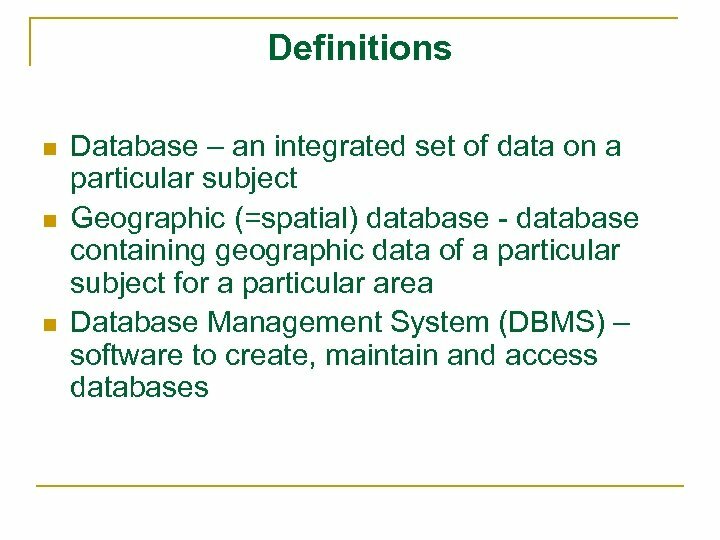 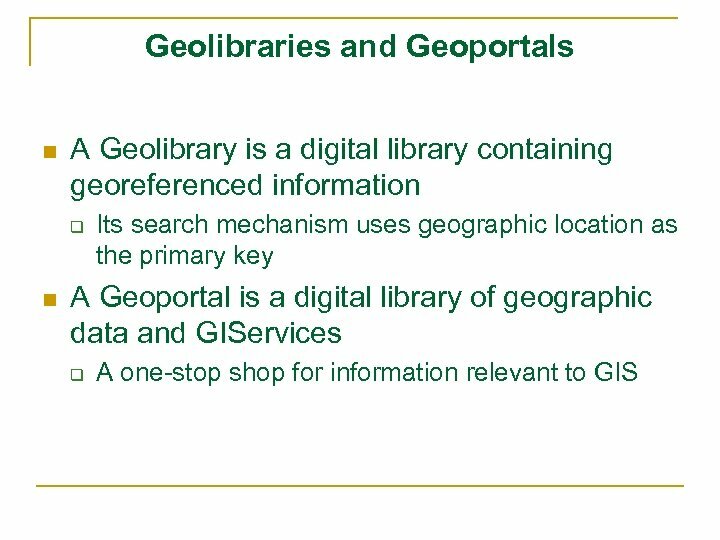 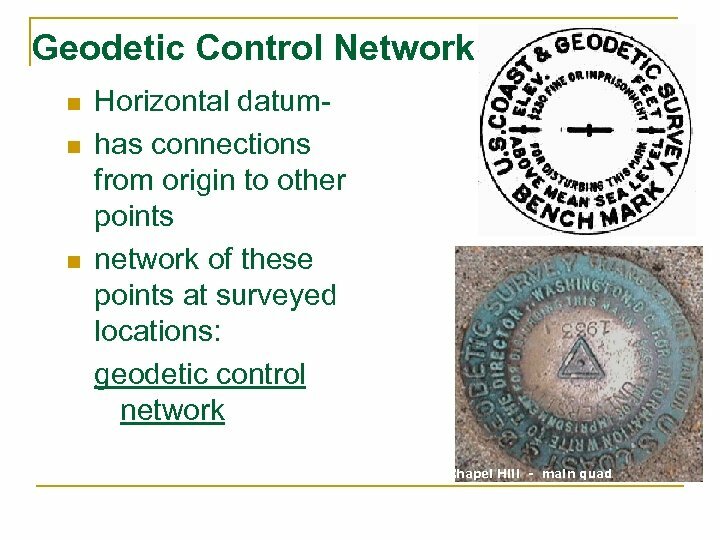 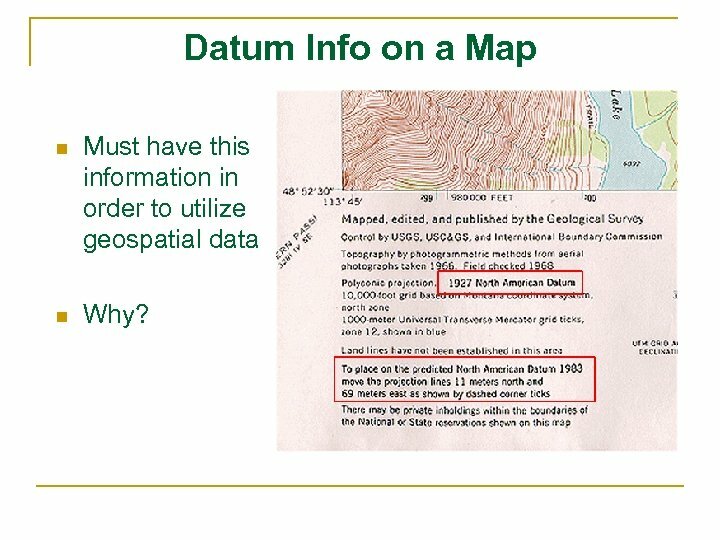 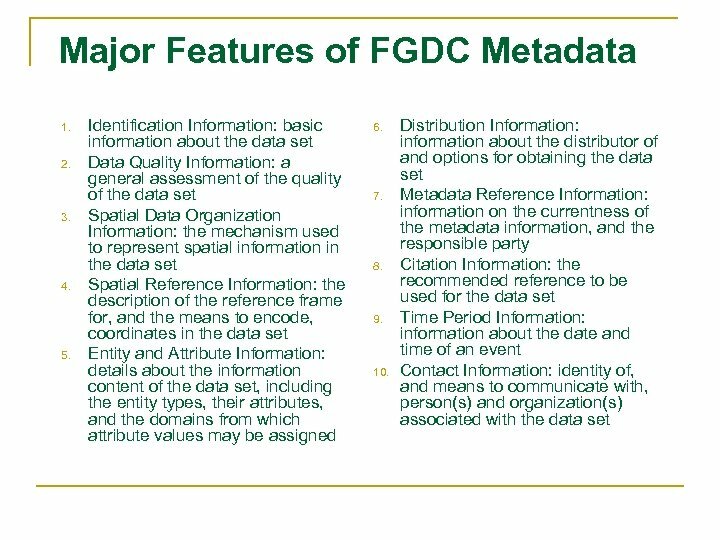 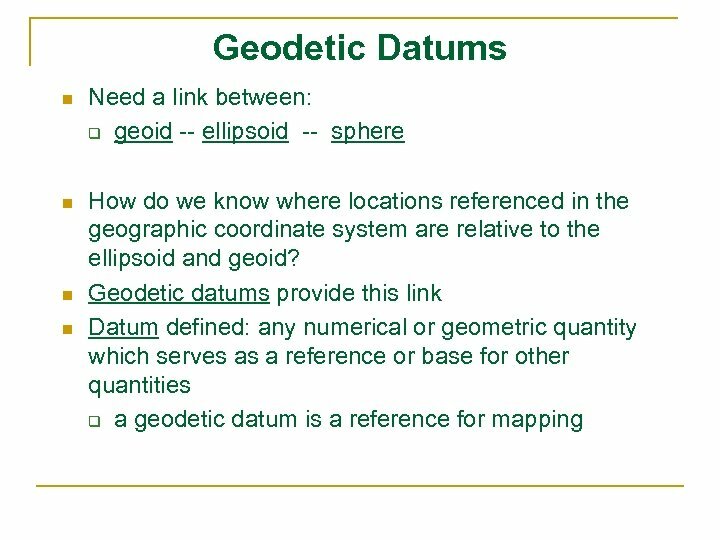 Datum Info on a Map n Must have this information in order to utilize geospatial data n Why? 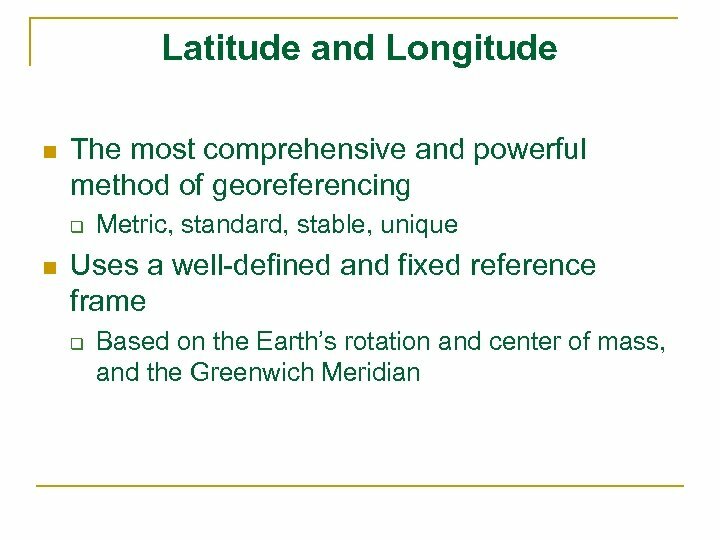 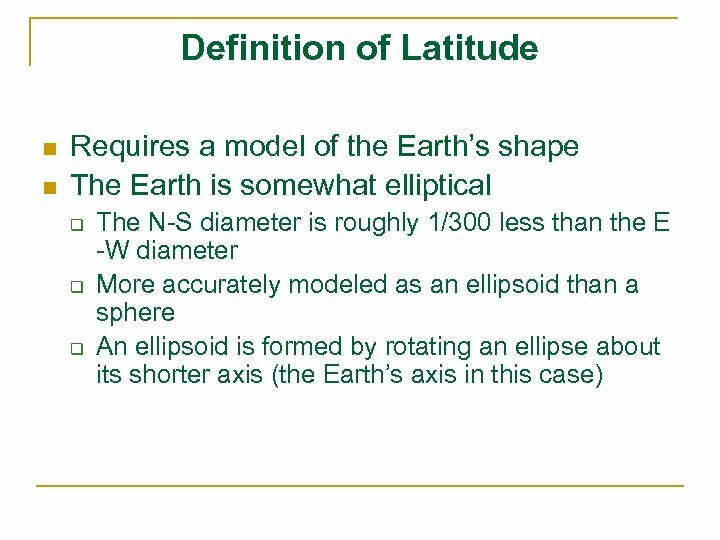 Definition of longitude. 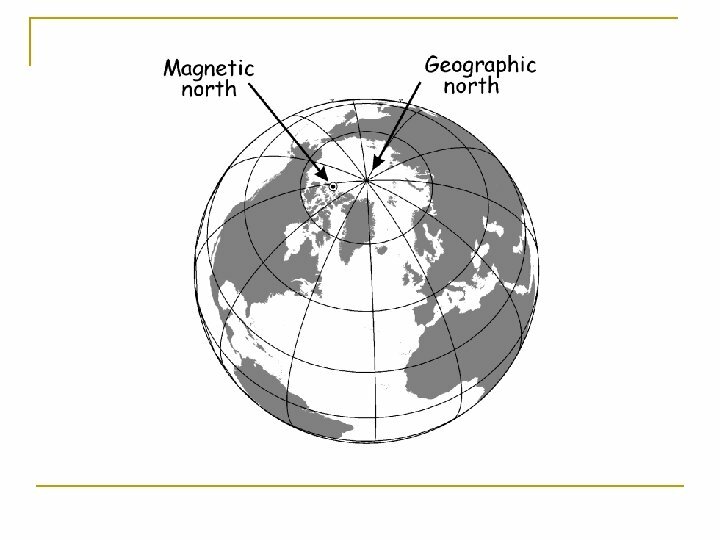 The Earth is seen here from above the North Pole, looking along the Axis, with the Equator forming the outer circle. 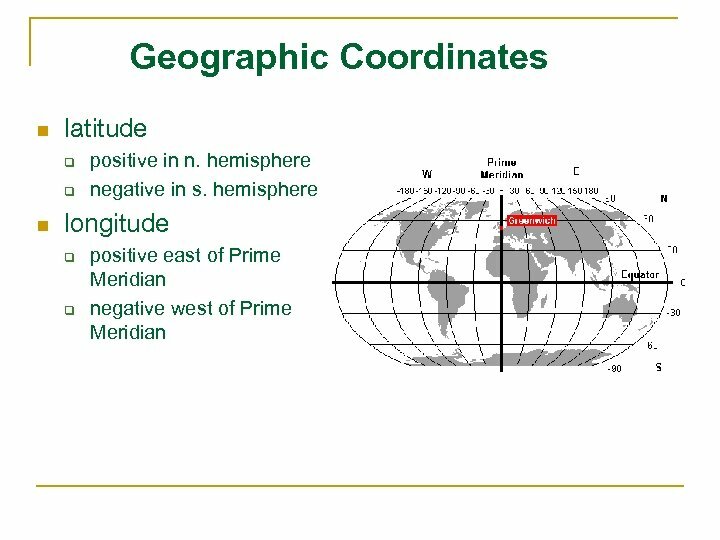 The location of Greenwich defines the Prime Meridian. 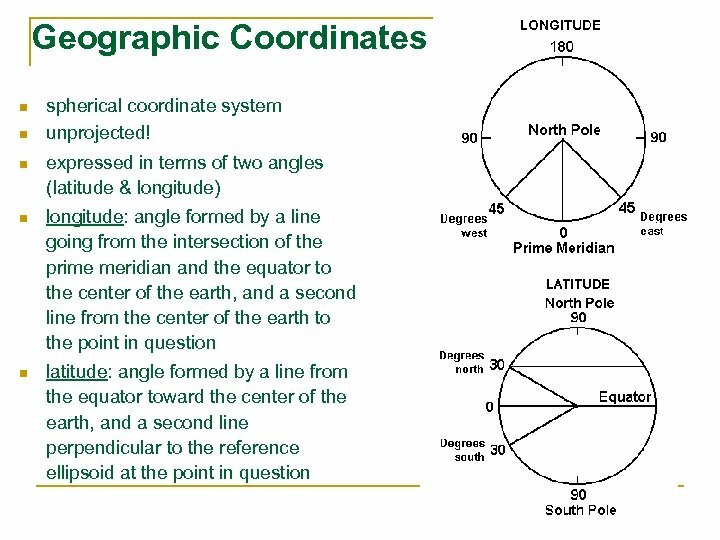 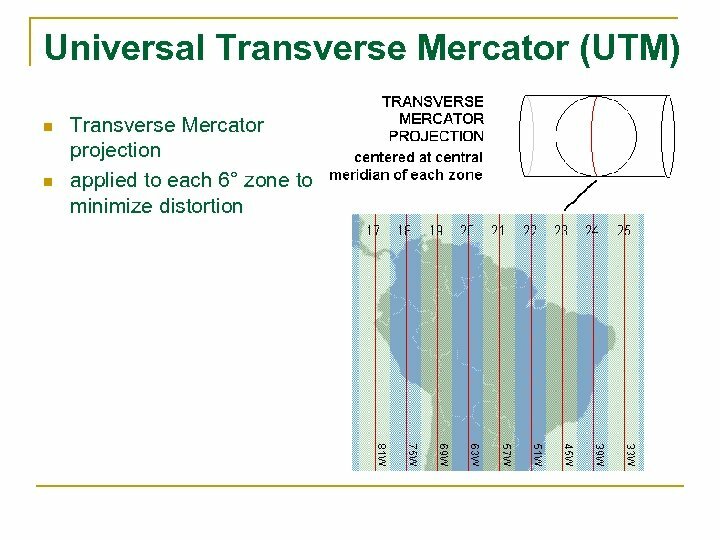 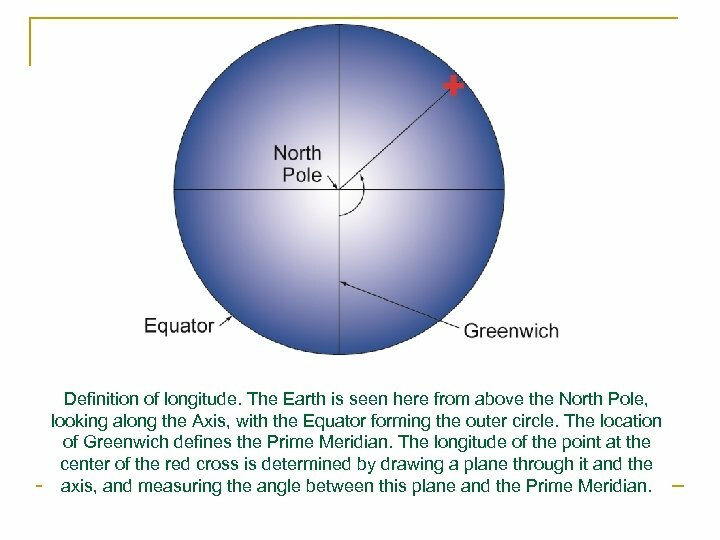 The longitude of the point at the center of the red cross is determined by drawing a plane through it and the axis, and measuring the angle between this plane and the Prime Meridian. 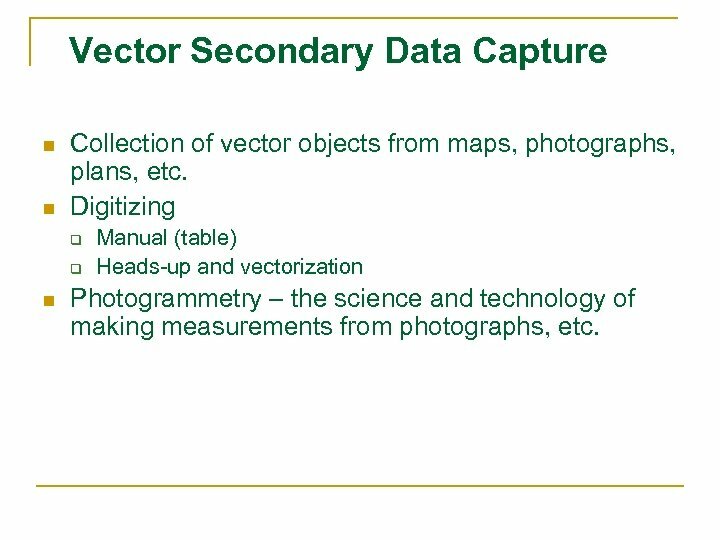 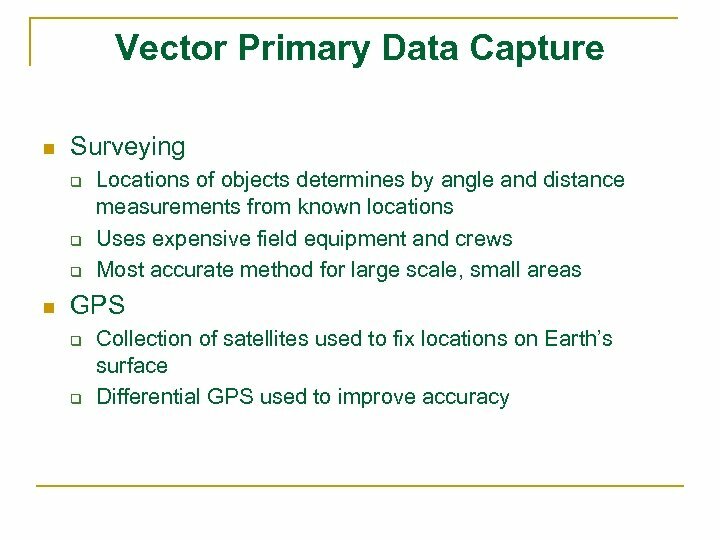 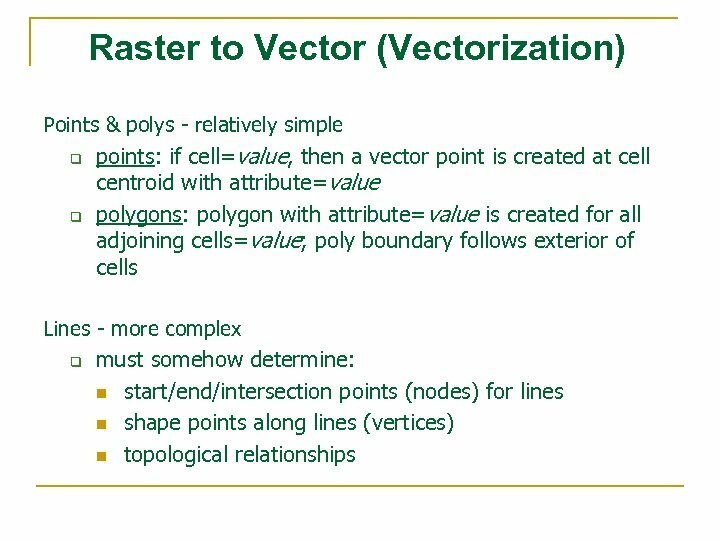 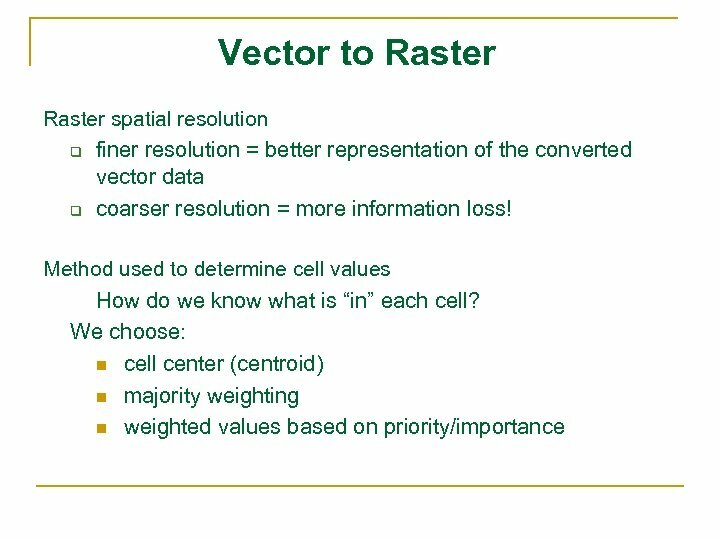 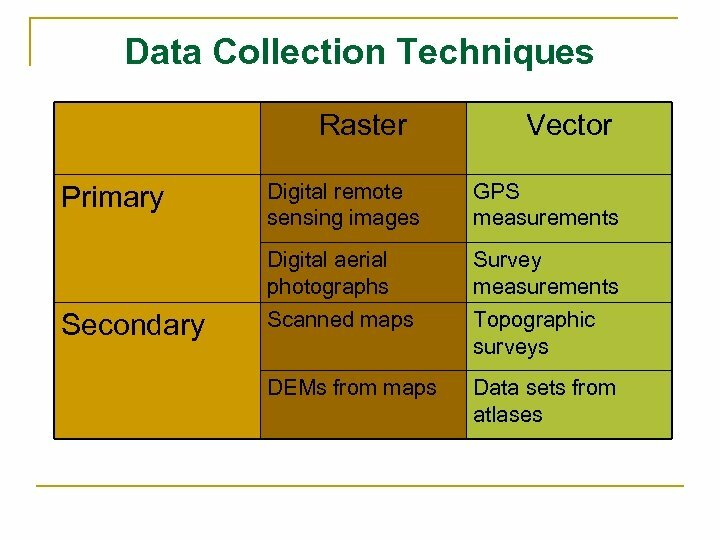 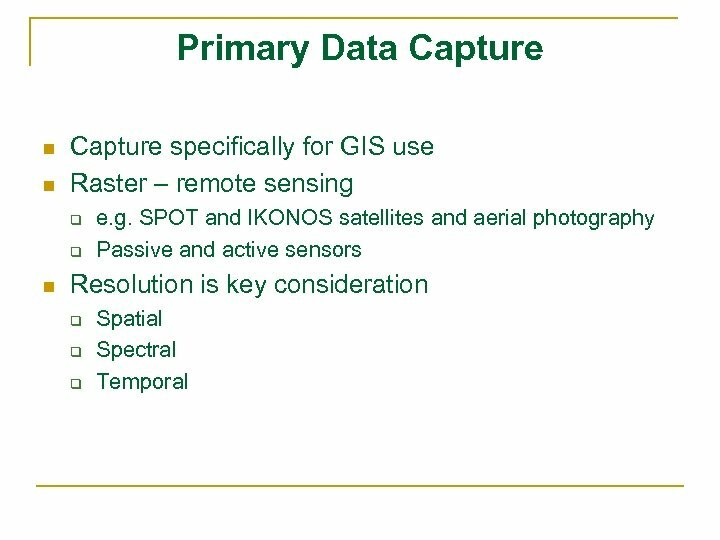 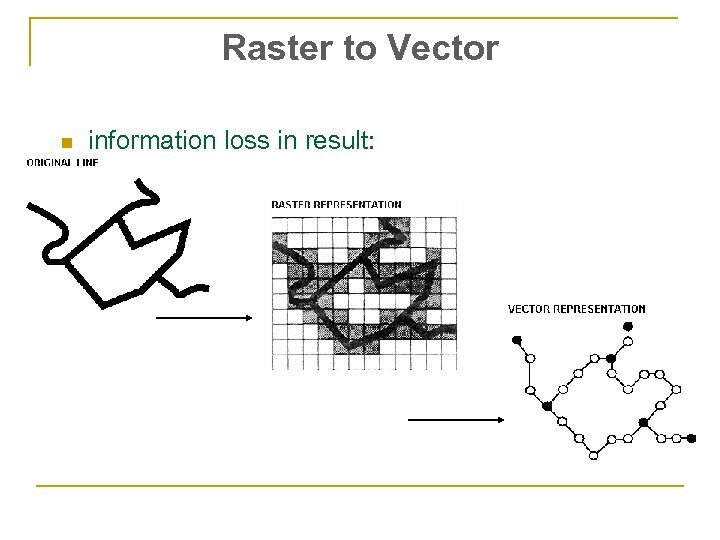 Vector Secondary Data Capture n n Collection of vector objects from maps, photographs, plans, etc. 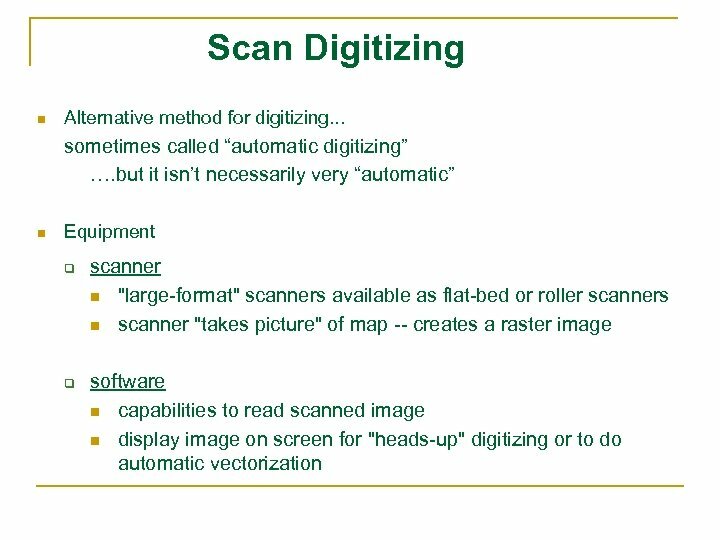 Digitizing q q n Manual (table) Heads-up and vectorization Photogrammetry – the science and technology of making measurements from photographs, etc. 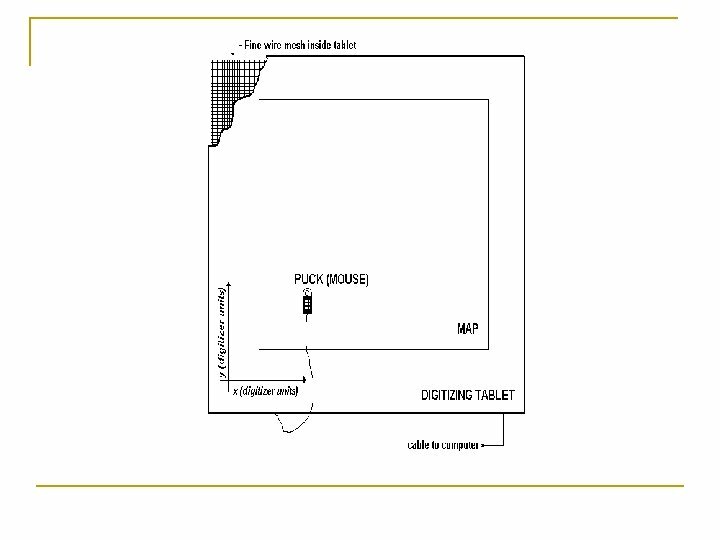 Tablet Digitizer & Software n n n contains fine (. 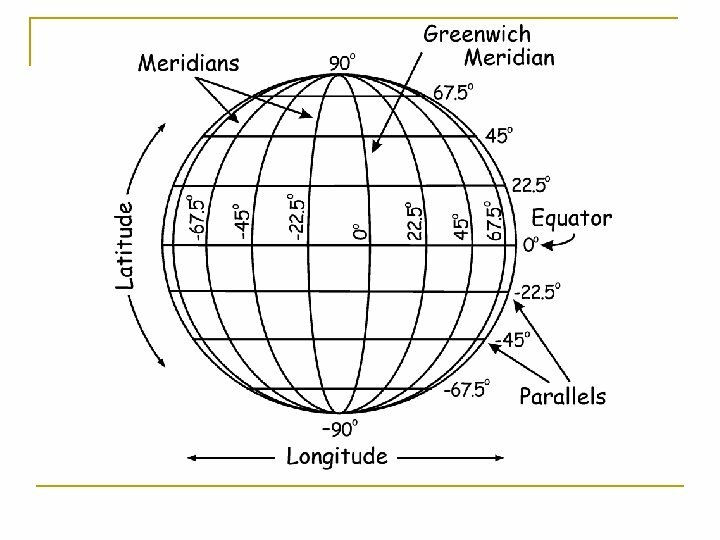 01” -. 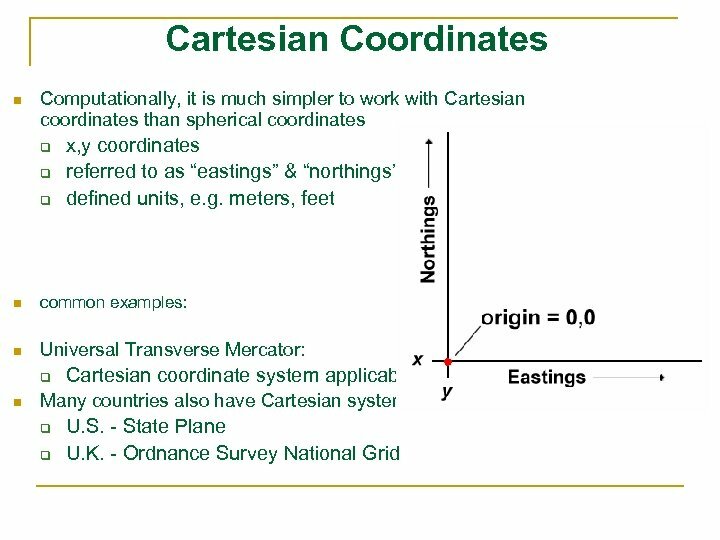 001”) mesh of electromagnetically charged wire common grid resolutions & pucks lead to accuracies ranging from. 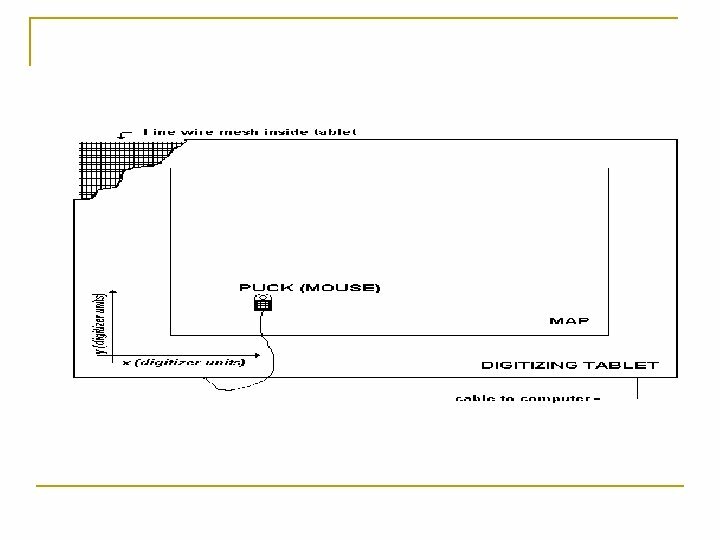 05 mm to. 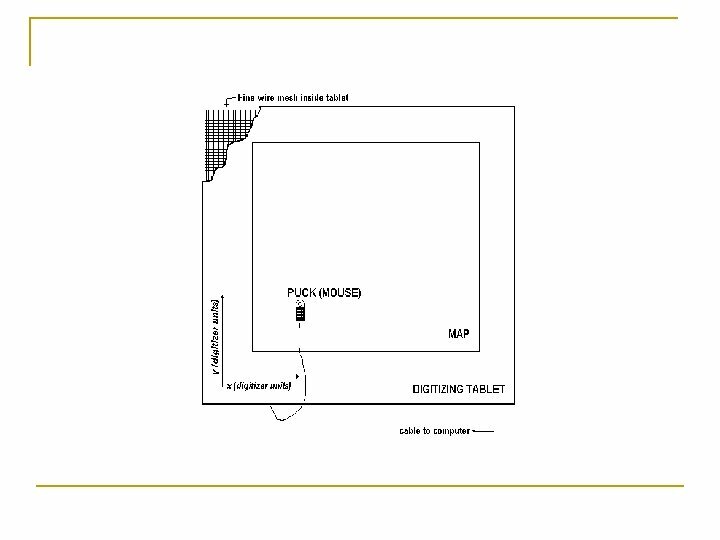 25 mm. 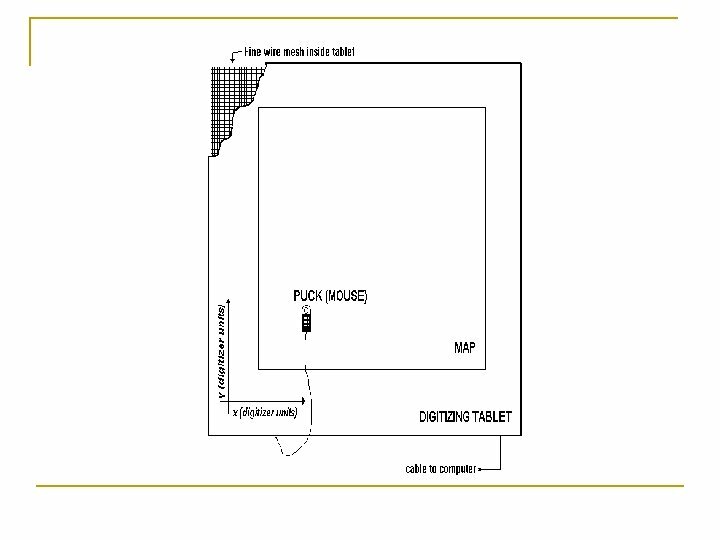 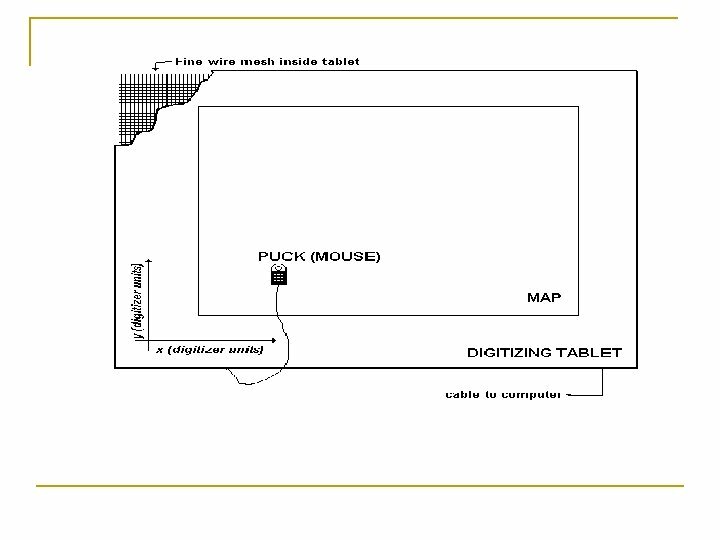 Puck- recognizes position on tablet relative to wire mesh. 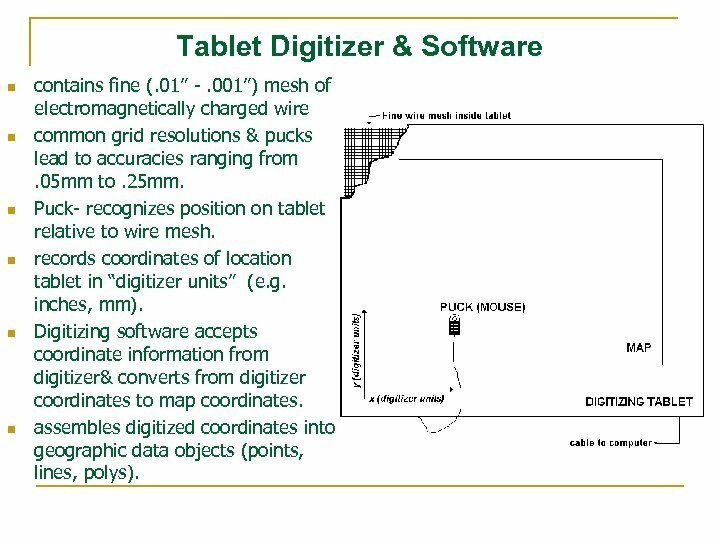 records coordinates of location tablet in “digitizer units” (e. g. inches, mm). 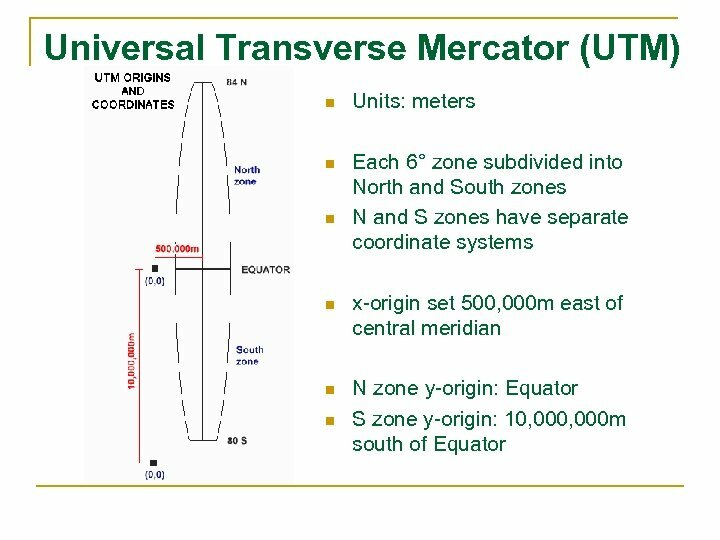 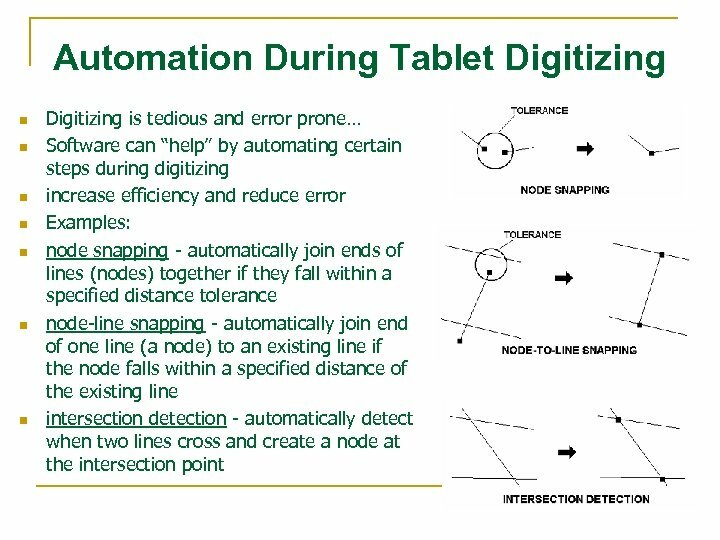 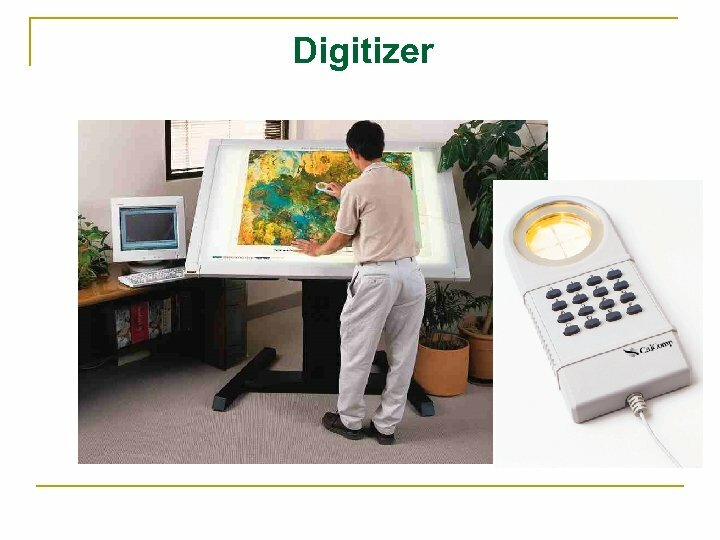 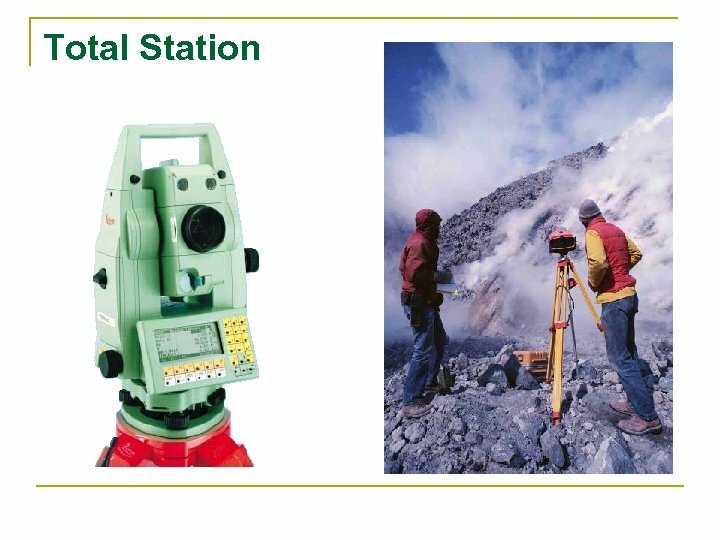 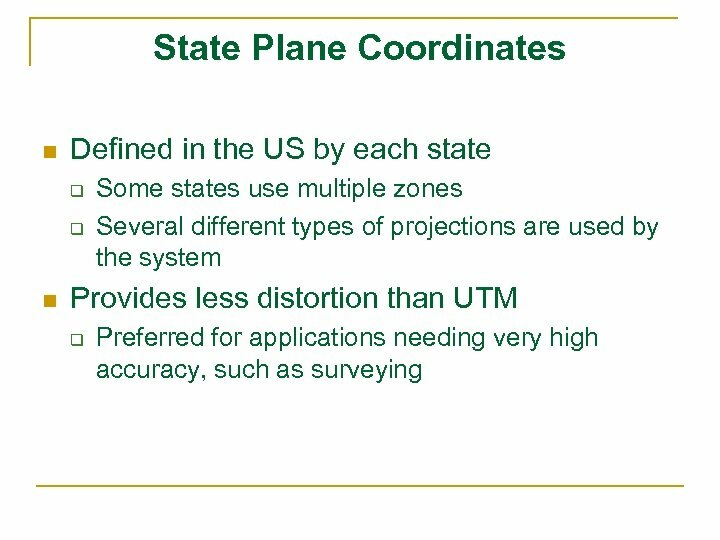 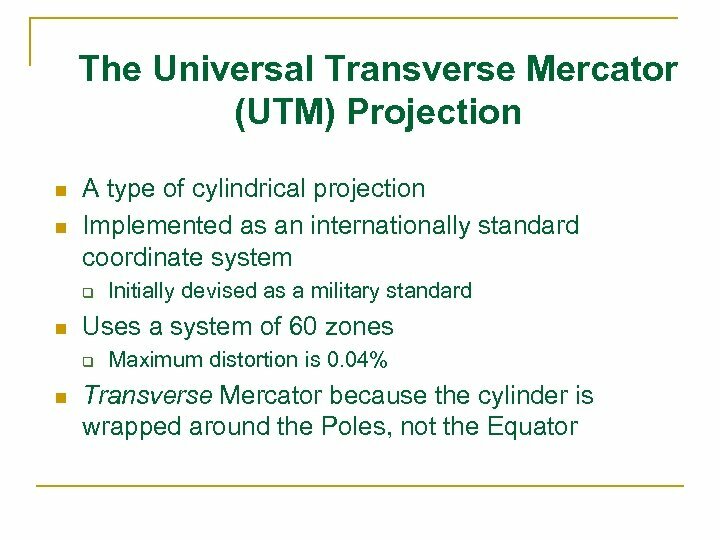 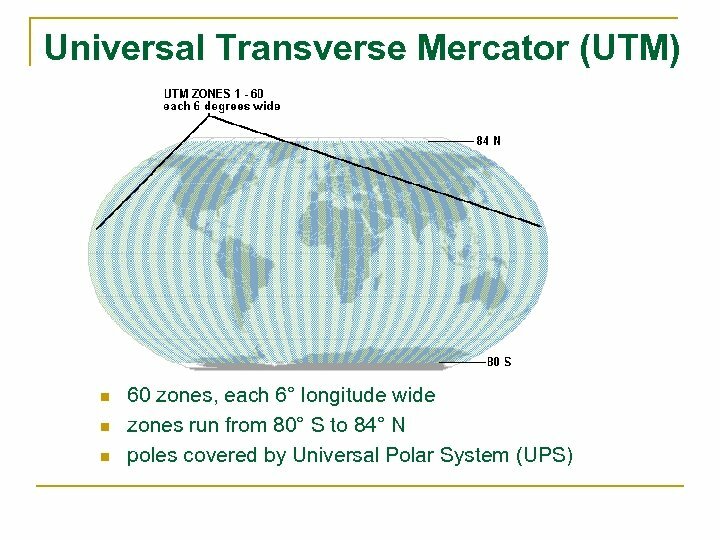 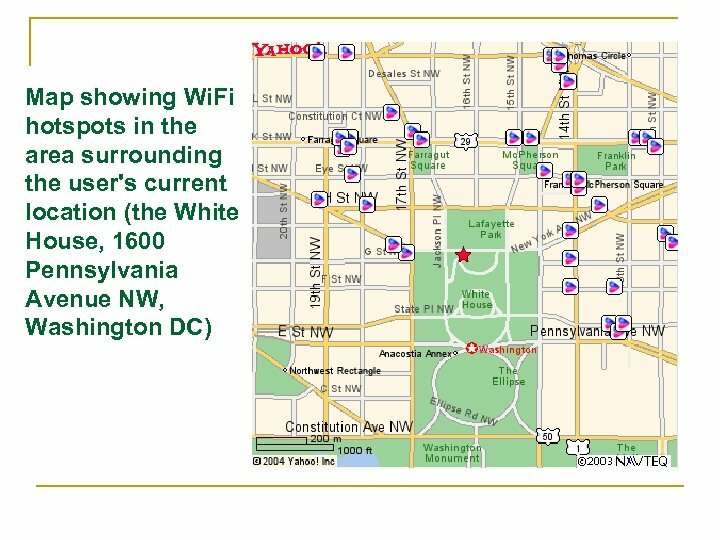 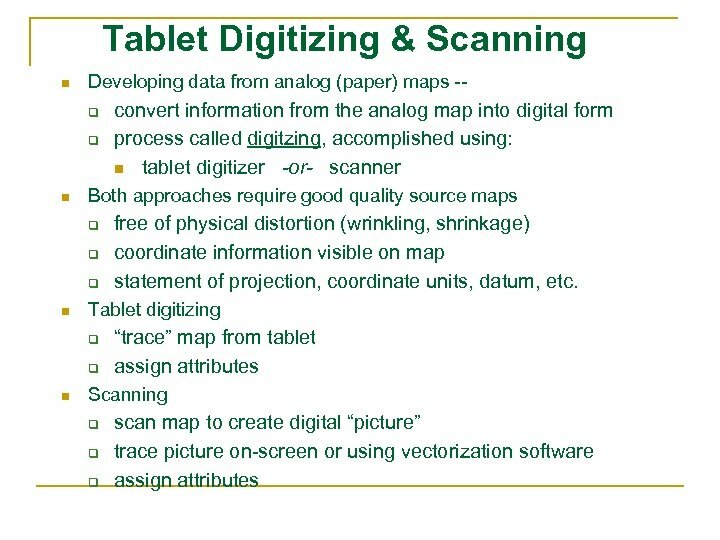 Digitizing software accepts coordinate information from digitizer& converts from digitizer coordinates to map coordinates. 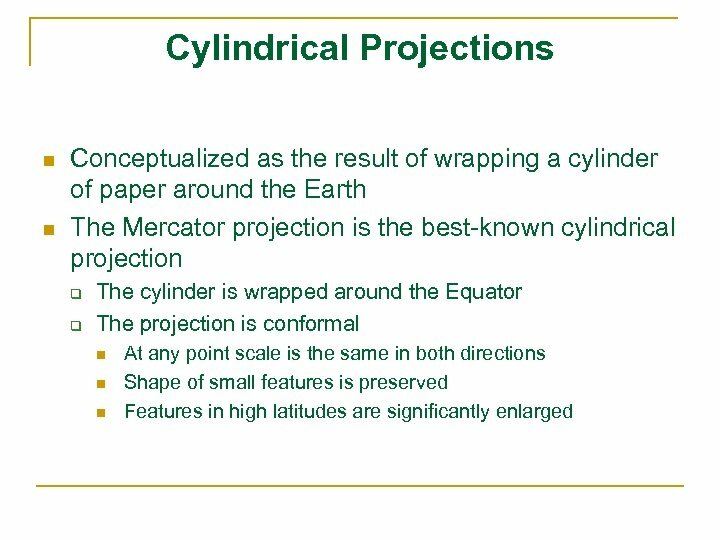 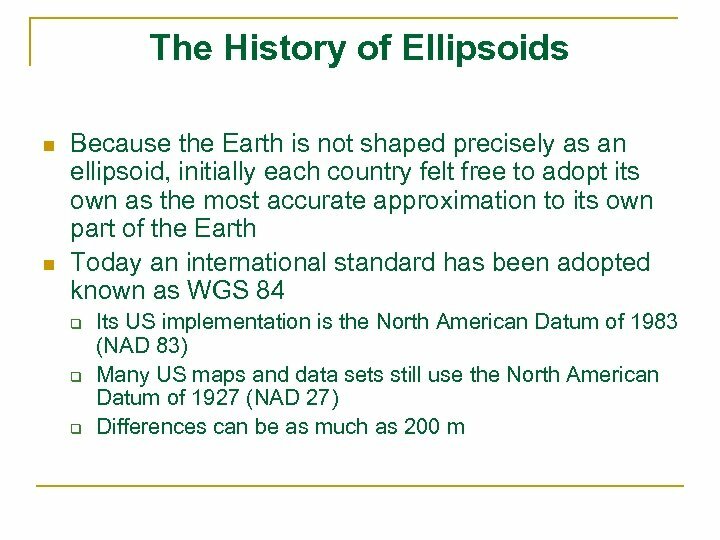 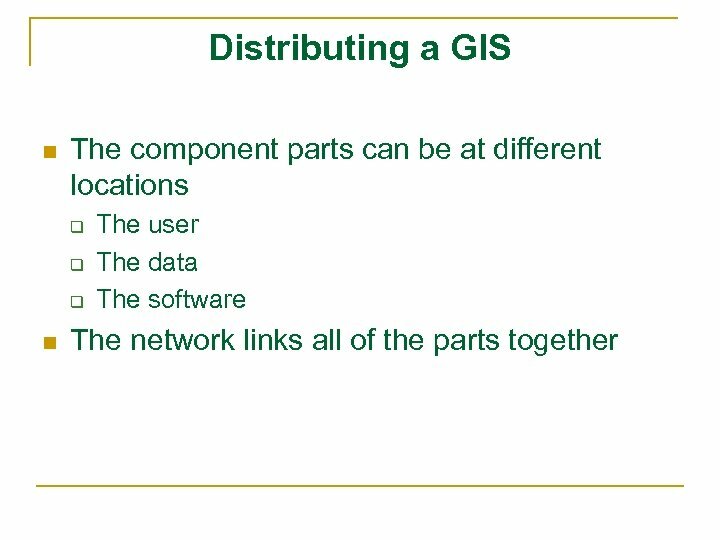 assembles digitized coordinates into geographic data objects (points, lines, polys). 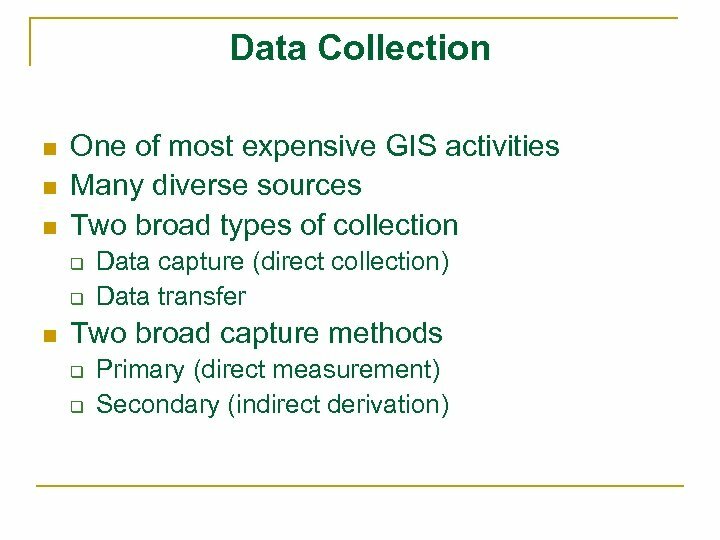 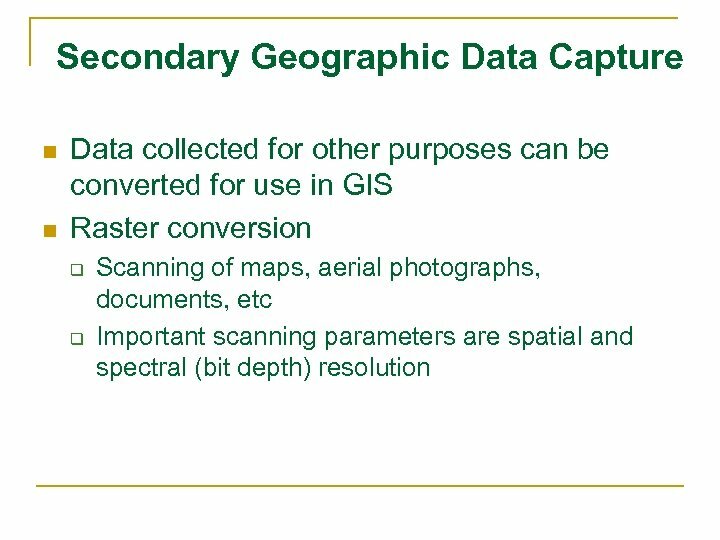 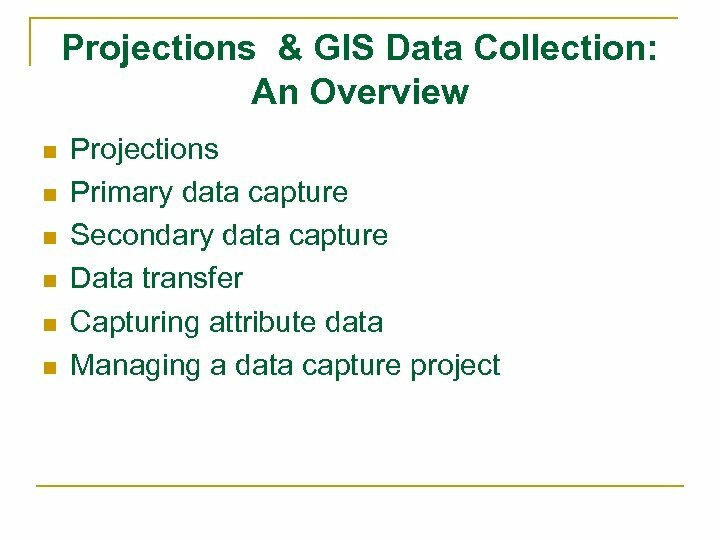 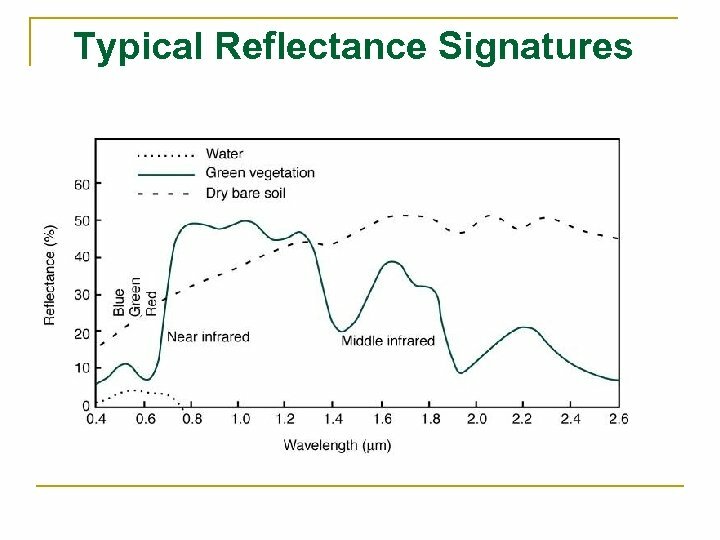 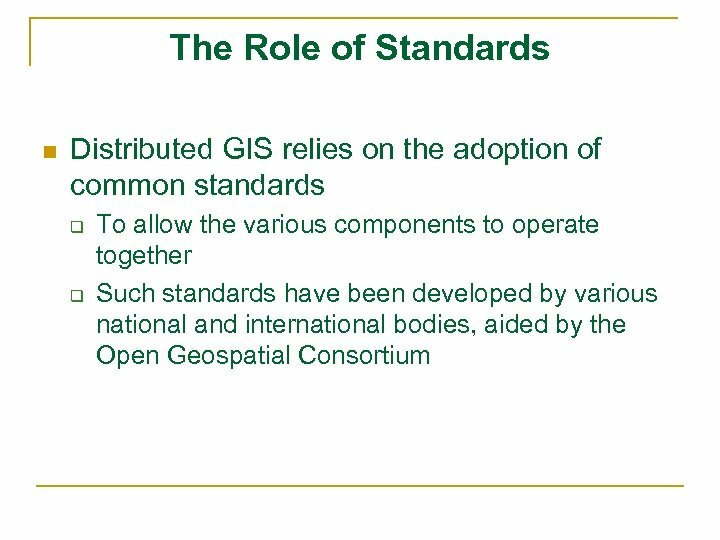 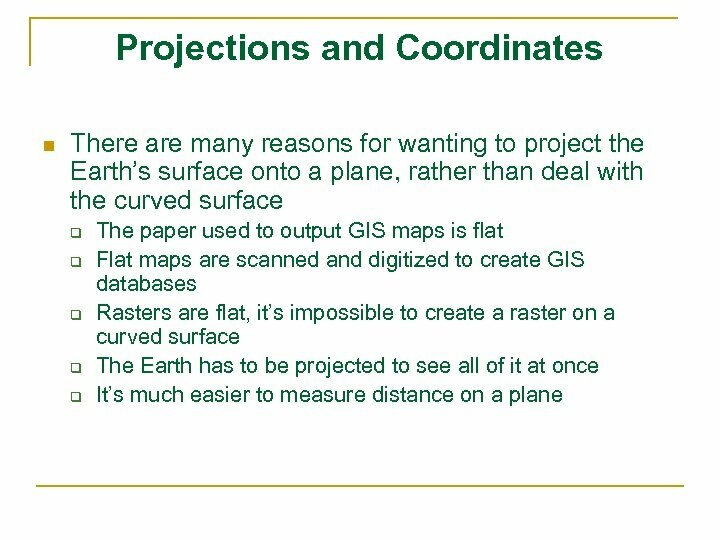 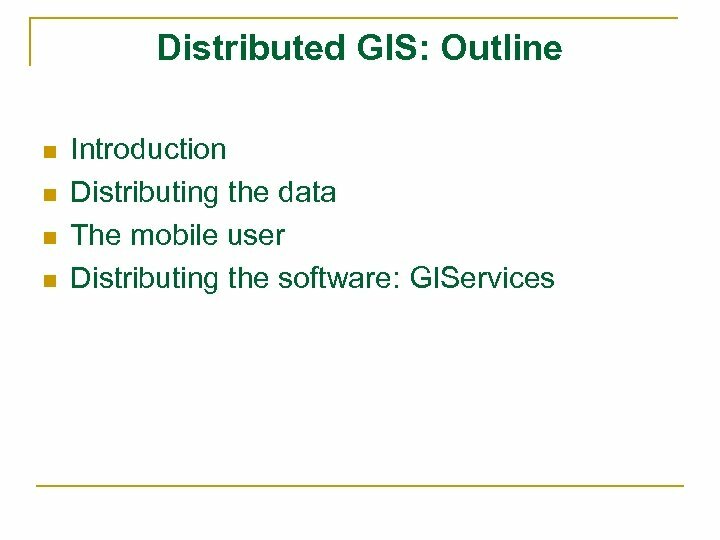 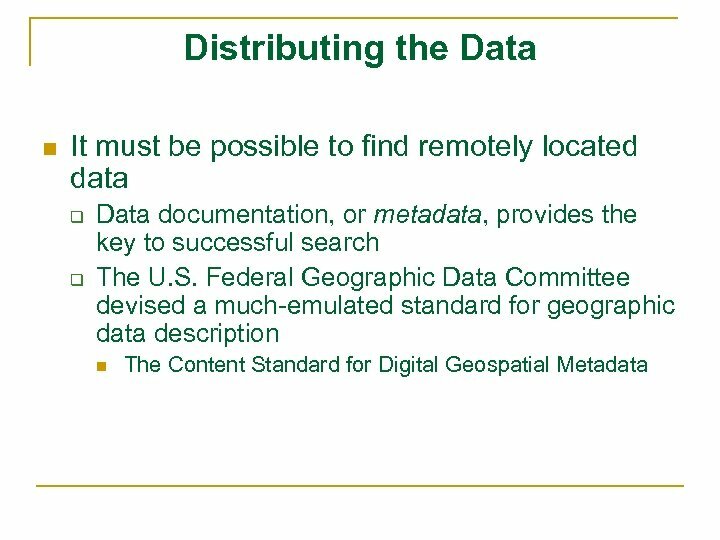 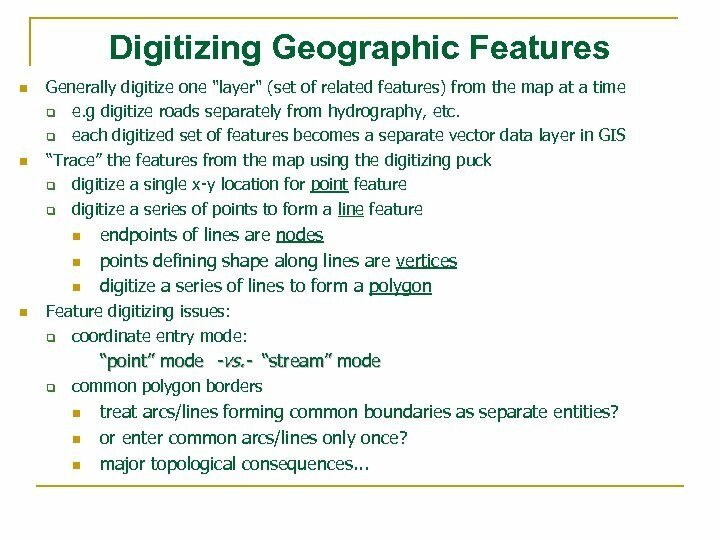 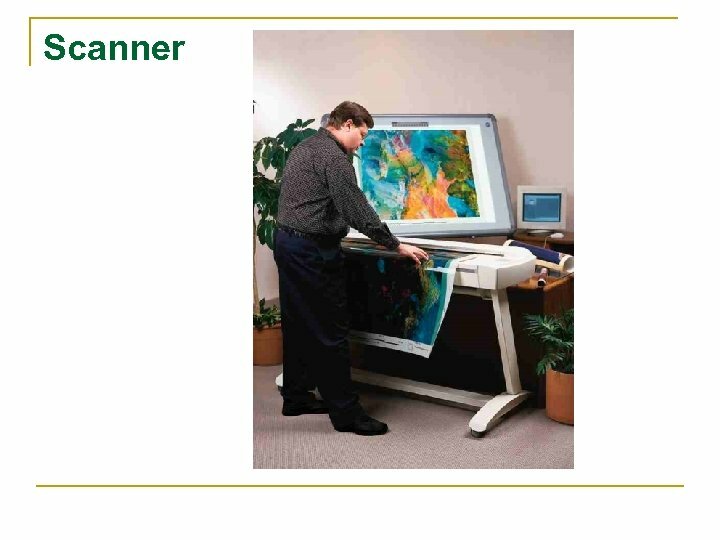 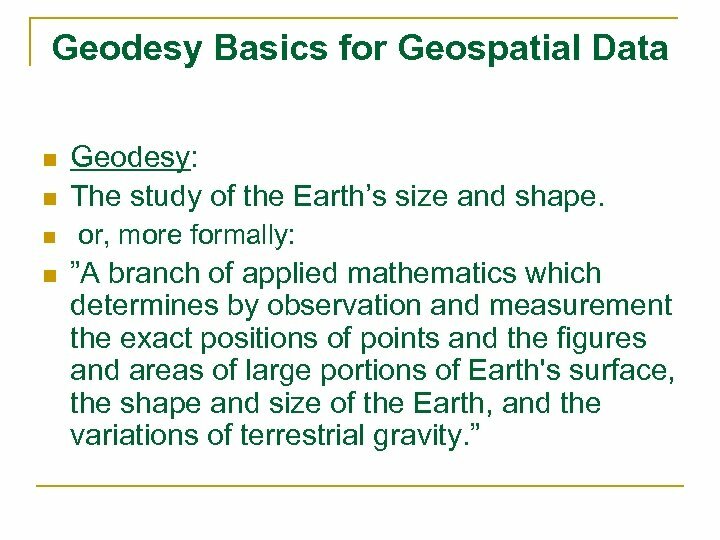 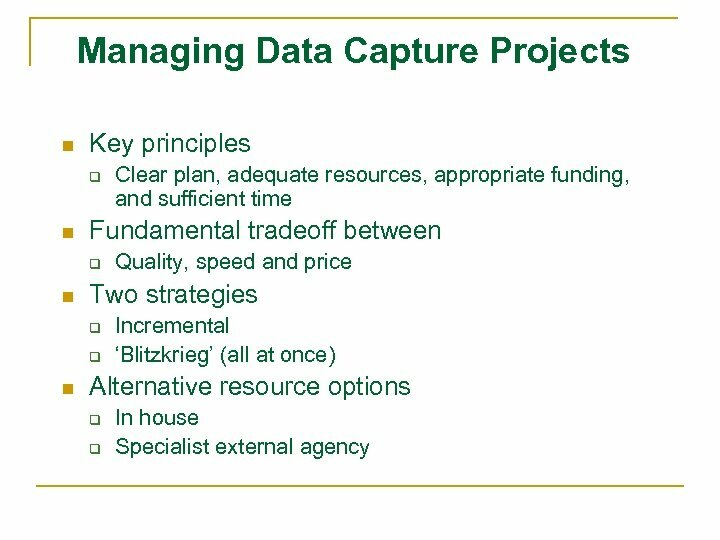 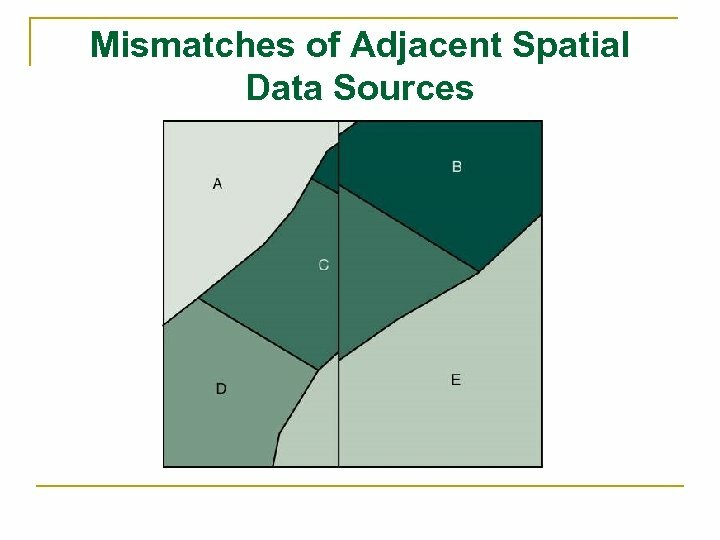 Digitizing Geographic Features n n Generally digitize one "layer" (set of related features) from the map at a time q e. g digitize roads separately from hydrography, etc. 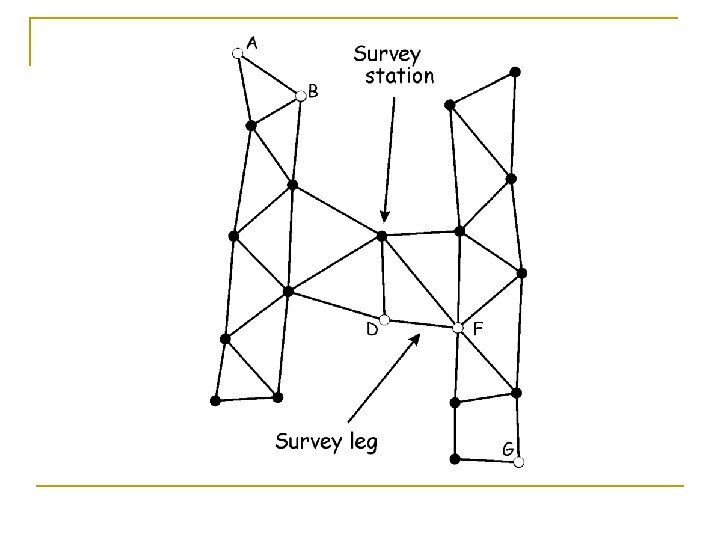 q each digitized set of features becomes a separate vector data layer in GIS “Trace” the features from the map using the digitizing puck q digitize a single x-y location for point feature q digitize a series of points to form a line feature n n endpoints of lines are nodes points defining shape along lines are vertices digitize a series of lines to form a polygon Feature digitizing issues: q coordinate entry mode: “point” mode -vs. - “stream” mode q common polygon borders n n n treat arcs/lines forming common boundaries as separate entities? 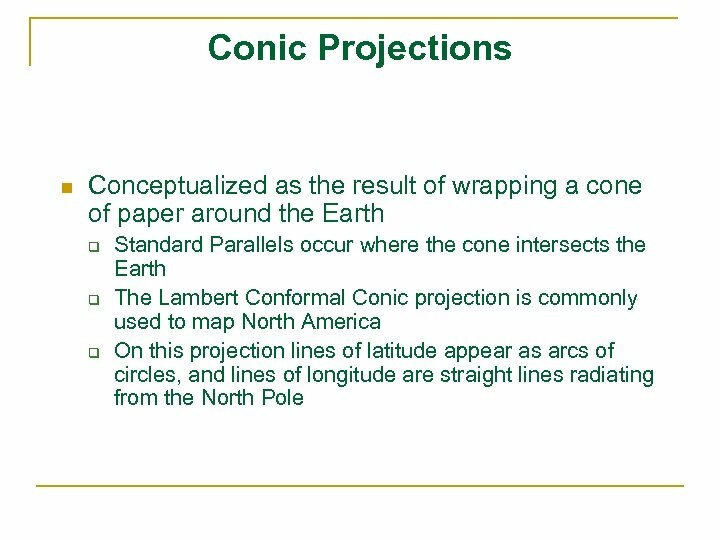 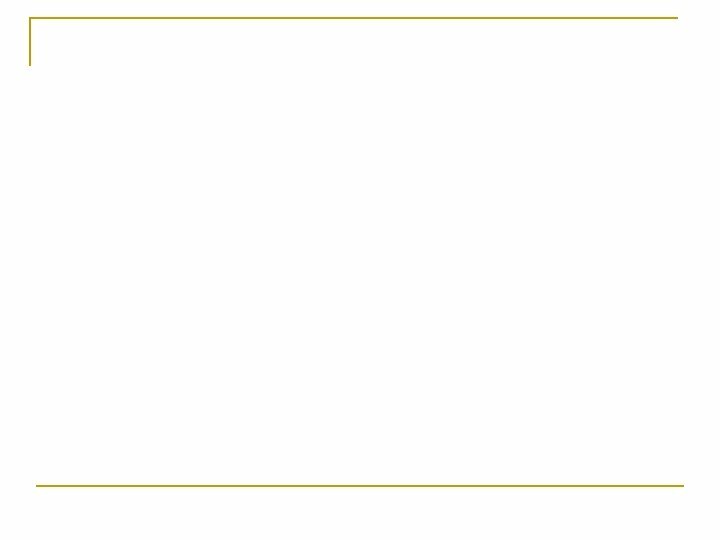 or enter common arcs/lines only once? 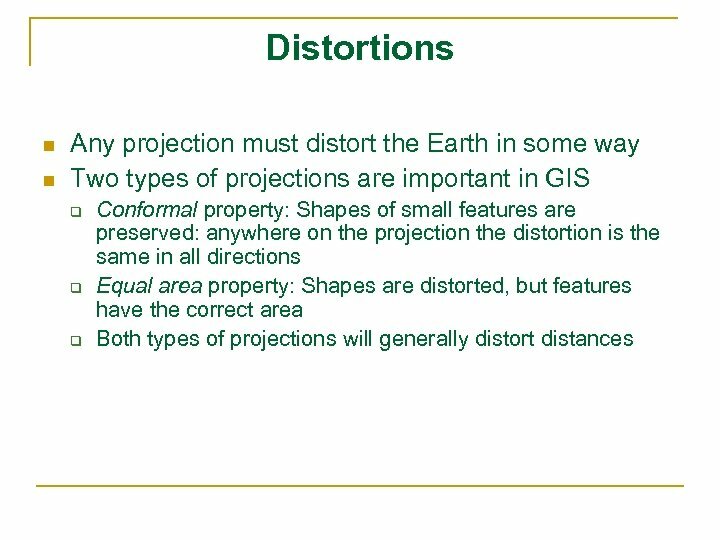 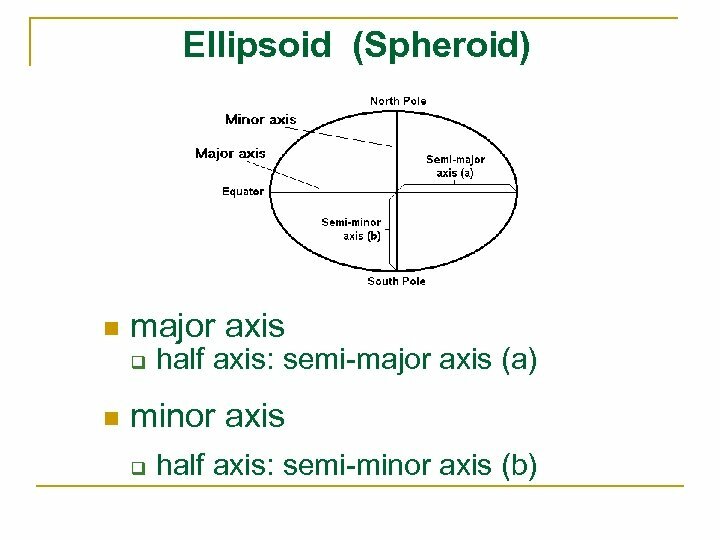 major topological consequences. 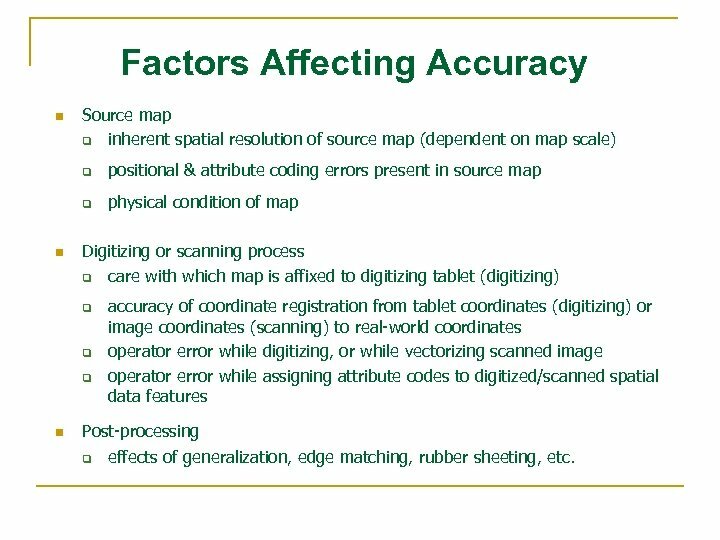 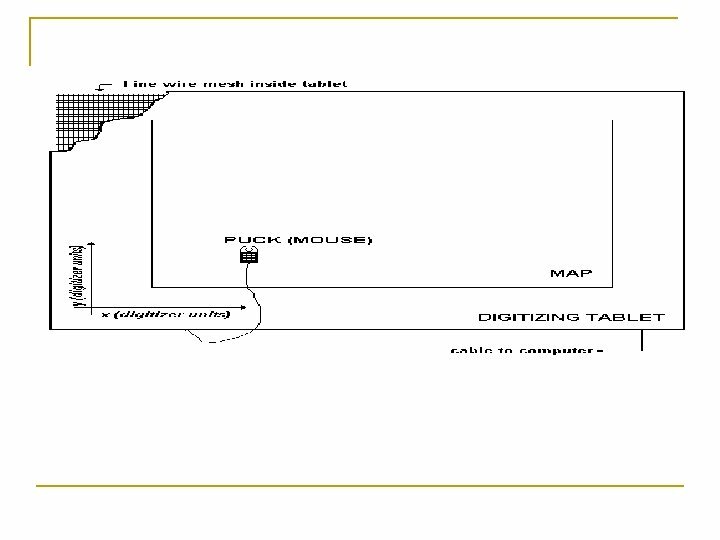 . .
Factors Affecting Accuracy n Source map q inherent spatial resolution of source map (dependent on map scale) q q n positional & attribute coding errors present in source map physical condition of map Digitizing or scanning process q care with which map is affixed to digitizing tablet (digitizing) q q q n accuracy of coordinate registration from tablet coordinates (digitizing) or image coordinates (scanning) to real-world coordinates operator error while digitizing, or while vectorizing scanned image operator error while assigning attribute codes to digitized/scanned spatial data features Post-processing q effects of generalization, edge matching, rubber sheeting, etc. 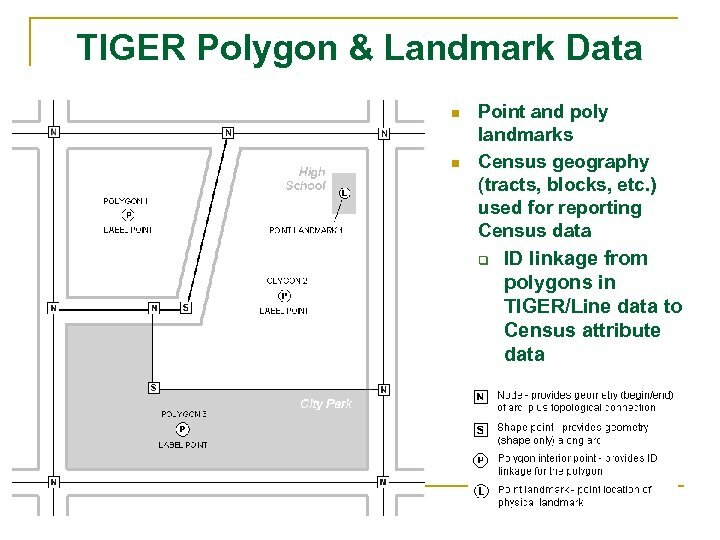 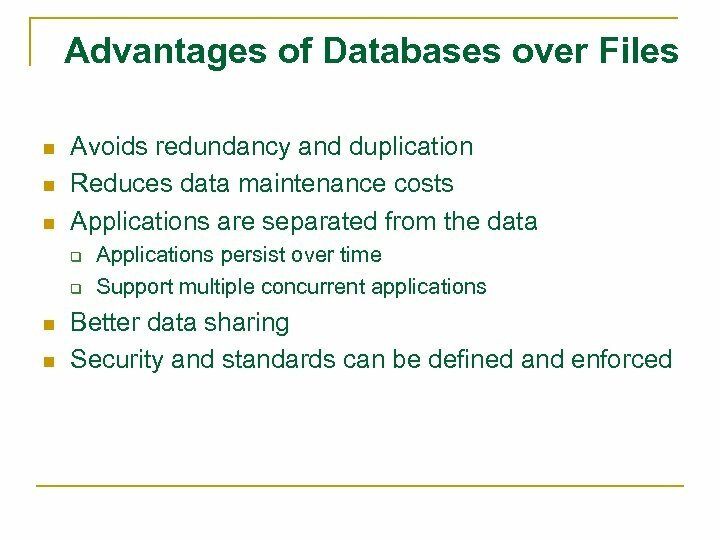 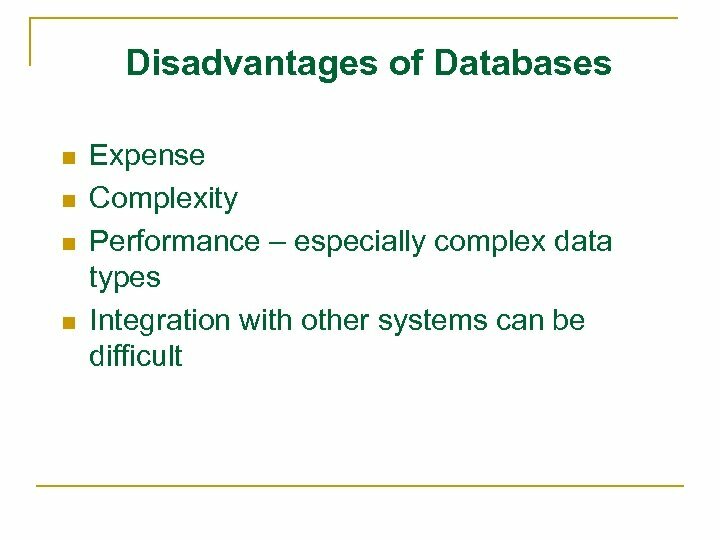 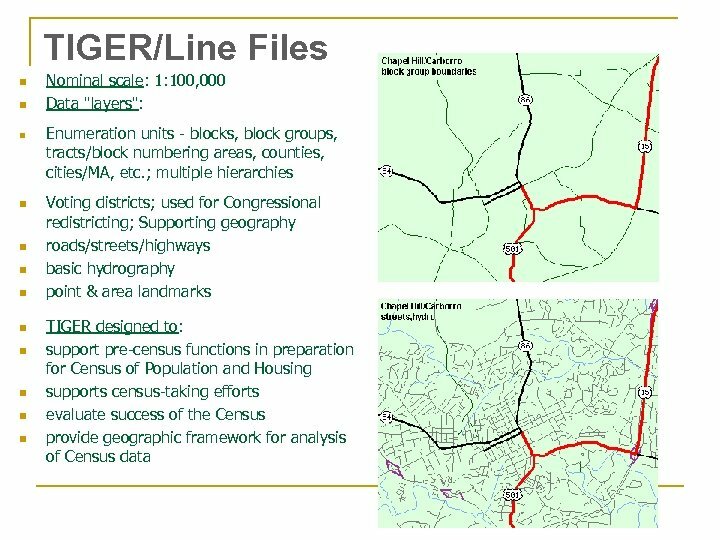 TIGER Line & Address Data n n n Linear features. 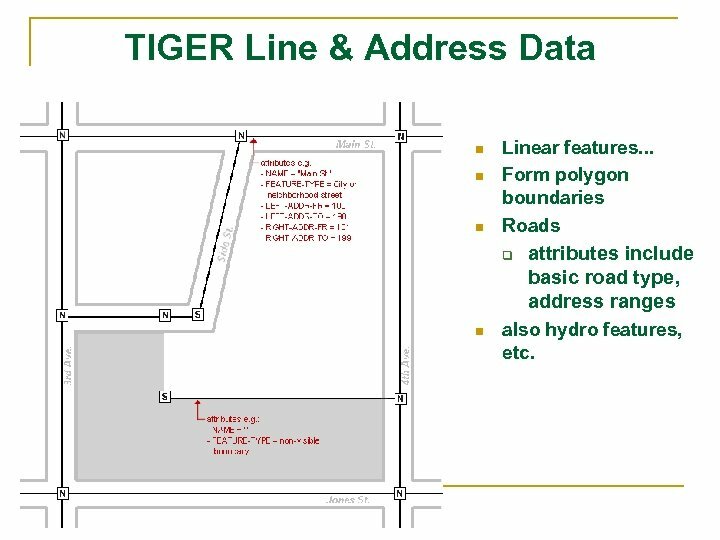 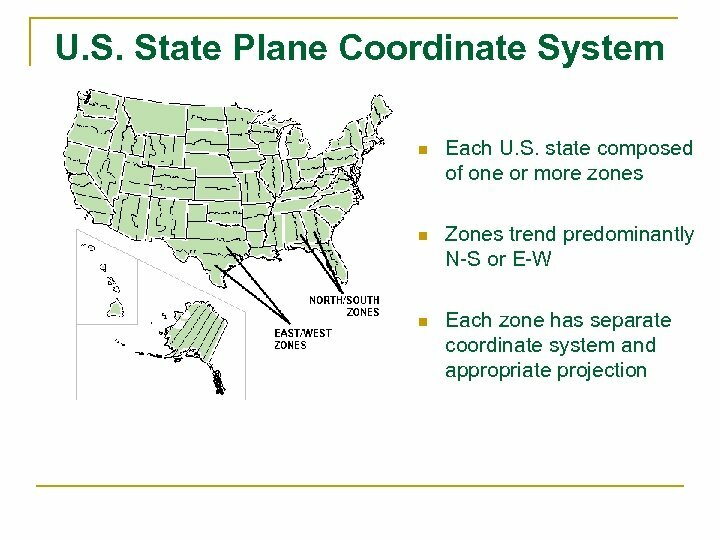 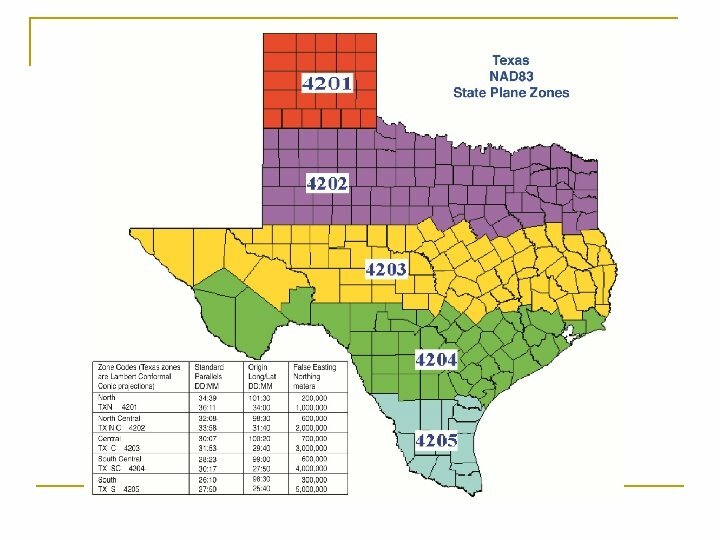 . . Form polygon boundaries Roads q n attributes include basic road type, address ranges also hydro features, etc.